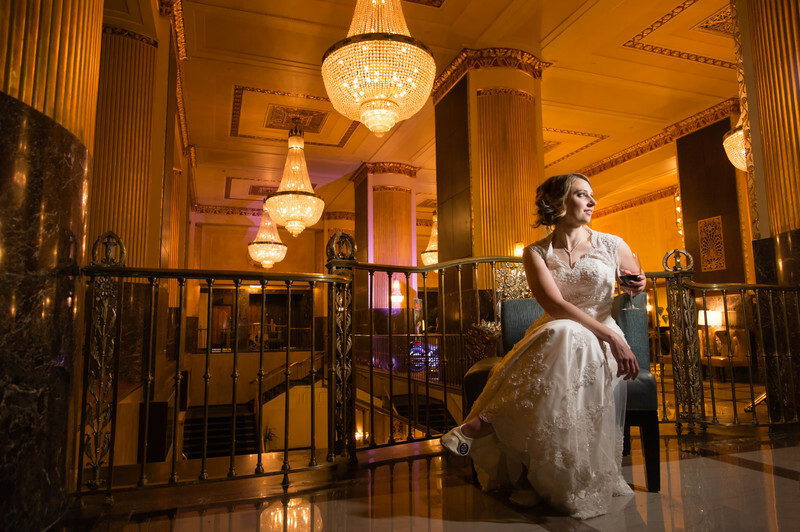 Beautiful bride in vintage 1920s glam dress featured in Hilton Milwaukee City Center lobby with crystal chandeliers. I love the vintage opulence of this hotel. It's a perfect place for Milwaukee wedding ceremonies and receptions. This Hilton Milwaukee wedding is one of my favorite weddings and this portrait embraces my passions as a photographer. Shannon is simply relaxing in a chair holding a wine glass, and I had a simple LED light coming in from the right side out of frame. Location: 509 W Wisconsin Ave, Milwaukee, WI 53203.